The Nets again found themselves reliving the “Groundhog Day” scenario, blowing a 14-point second-quarter lead, fighting back against the team with the NBA’s best record to force overtime, then waiting to get beaten by yet another star turn. But after losing eight straight games and after blowing an NBA-high eight double-digit leads this season and after losing eight straight home games, the Nets saw their luck finally turn. Rondae Hollis-Jefferson stopped Raptors star Kawhi Leonard on the last shot of regulation and forced him to give up the ball at the end of overtime. Then Van Vleet’s shot missed as the buzzer sounded, allowing the Nets to escape with a well-earned 106-105 victory Friday night at Barclays Center. No one felt more relief than Russell. 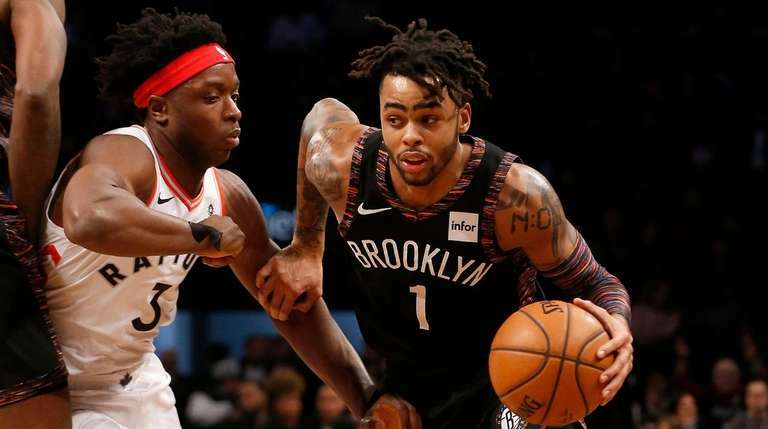 He had a great game, scoring 15 of his 29 points in the third quarter to keep the Nets in the game and scoring the first six Nets points in overtime before assisting on a basket by Jarrett Allen that gave them a 106-105 lead with 1:04 left. But after a Raptors miss, Russell committed a turnover with 24.1 seconds left to give Toronto a chance for the final shot. Did we say they had seen this movie before? Yes. One game earlier, it was Thunder star Paul George who hit the last shot to beat the Nets. Less than two weeks earlier, it was 76ers star Jimmy Butler who made the last shot. But the Nets were determined to write a new ending, and they did. “We’ve seen that the last few games,” Russell said. “Teams had good luck on us when it came to that situation, but the basketball gods blessed us. Hopefully we can run off a few now. The Nets (9-18) got 17 points and eight assists from Spencer Dinwiddie, 12 points and 10 rebounds from Allen and a season-high 15 rebounds from Ed Davis to help them pound the Raptors 60-41 on the boards. Leonard had 32 points and Jonas Valanciunas added 24 for the Raptors (21-6), who shot only 39.3 percent. The Nets have struggled to maintain offensive productivity in the fourth period, but even though Toronto vigorously contested everything at the three-point arc, Dinwiddie got to the rim for eight fourth-quarter points. In overtime, Russell hit three mid-range jumpers for a 104-103 lead before Leonard’s basket put the Raptors up one with 1:49 left. Russell then drove and fed Allen for the go-ahead basket. Finally, Van Vleet’s miss came as an answered prayer for the Nets.